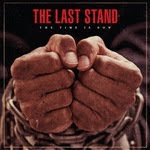 The upcoming album by New York’s The Last Stand entitled 'The Time Is Now' will be out via Eulogy Records in January. Guest appearances on the album include Lou Koller (Sick of It All), Joseph James (Agnostic Front), and Dave Franklin (Vision). The Last Stand is a band made of ex-members of Shutdown (Dion DeNardo-bass, Stephen Della Croce- guitar, Jimmy McCormack-drums) and Mike Scondotto of Inhuman fame. The band has recently released new song - Unleashed - as a teaser for the new album.